Is Too Many Mussels Even Possible? We love mussels. So when we saw them on the weekly menu of fresh seafood from our local food co-op, we immediately placed our order. But be warned: This is a lot of mussels. My wife swears she didn’t see the print describing a five-pound bag. Imagine her surprise when I placed this big bag of bivalves in the sink. Five pounds for the two of us? In situations like this, there’s nothing else to do but soldier on. She sautéed shallots and garlic in our cast iron wok, added some vermouth (you can use dry white wine) and as it came to a boil, half the mussels. I promised to eat the other half the next day. On advise from a recipe she found online, the cook added some cream to the broth. I’ve since decided I prefer my mussels sans dairy. 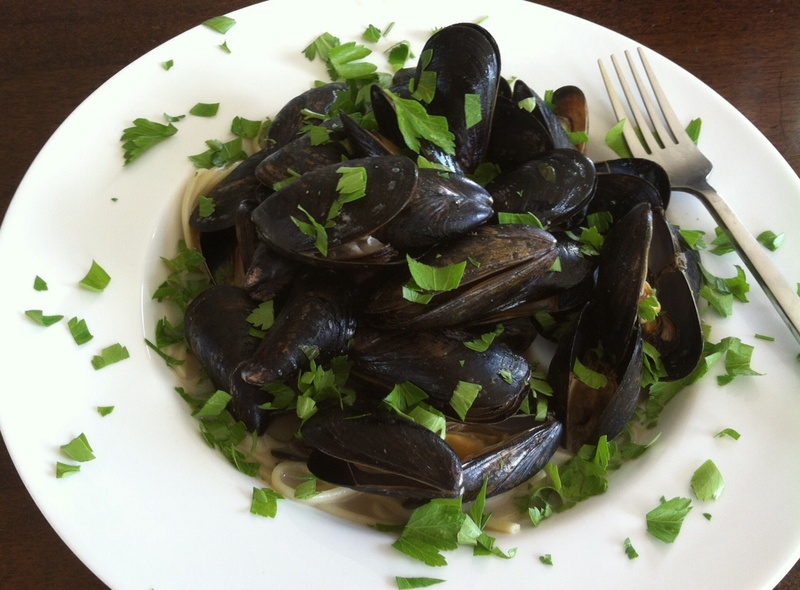 We served the cooked mussels over linguine, which is fine as far as it goes. But even though I don’t eat bread much anymore, having tried the linguine, my vote goes to a nice crusty loaf of country bread to sop up that delicious broth. What you see here is my lunch of the other half of the mussels, cooked in broth left over from the evening prior. Still damn good.